A non-intrusive and accurate method for measuring temperature in your patients, choose our Forehead Thermometer Lcd. 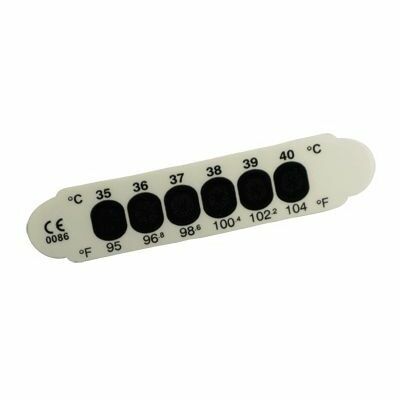 Manufactured into a lightweight and portable strip design, each thermometer features a liquid crystal indicator that clearly identifies temperature with 1 Degree increments. Clear coloured indicators show when a body temperature reaches over the normal range of +35oC to 40oC while the entire thing simply needs to be placed against the skin to receive an accurate reading. A convenient tool for any environment that cares for the well being patients, residents or children. Alongside our forehead thermometer, we stock a wide range of Medical Thermometers to suit every requirement from our standard Digital Thermometer through to the Kinetik Non-Contact Thermometer 3-in-1.